Mikumi National Park – 283 Kilometers away west of the Tanzanian Capital of Dar es Salaam; Mikumi National Park is located on the Iringa Highway; north of Selous Game Reserve, the largest Game Reserve in Africa en route on your way to, Ruaha National Park and Katavi National as well as Udgzungwa National park, all these the undiscovered gems of the Southern Tanzania Safari. Mikumi Safari – This park covers an area of 3230 square kilometers of which only part of it has been developed for tourism infrastructure wise. The Mkata flood plains in particular is the area with good infrastructure demarcated roads for game drives purposes but plans are underway to develop the rest of the park and put in place roads to enable the utilization of the whole park for game viewing and even walking/trekking purposes. Mikumi National Park borders Selous Game Reserve and is also part of the larger Selous Ecosystem. The park is accessible all year round and the Mkata River ensures a year round supply of water and foliage for animals and it is here where you can spot the most largest antelope in the world; the elands, as well as the rare Greater Kudus. Other animals that can be spotted in the park include the giraffes, buffaloes, zebras, wildebeests as well as the rare sable antelopes. The trade mark large herds of elephants of Mikumi which at times go rowdy can not go unmentioned. The miombo woodlands of the foot hills of the mountains that rise above Mikumi national parks; borders offer awe inspiring views. For birders, please prepare to spot the resident yellow-throated long claw, the lilac breasted rollers, bateleur eagle, and many aquatic birds at the two hippo pools just a few kilometers from the Entrance of the park. 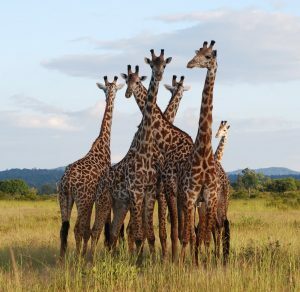 Mikumi national park is an ideal destination for the weekend type or short escape from Dar es Salaam, but it is often incorporated on the longer itinerary that includes Selous, Ruaha National Park as well as Katavi National park and hiking on the Udzungwa National Park. If you do not fancy the classic touristy destinations of Northern Tanzania then you better be heading to the south. Please let us contact us anytime you want to discover the hidden treasures of the south and we shall tailor your safari of a life time. Any time you wish to do a Safari in Mikumi from Dar es Salaam or as part of a longer Tanzania Safari, just contact our safari experts. Below are some Packages Including Mikumi Safari.